Now for a post about performances of Fight Call, a New Musical! It’s been a few weeks since Fight Call closed, but I never got a chance to blog about performances, and since I have an unusual stretch of free time before gearing up for midterms, I thought now would be a great time to discuss the performances. 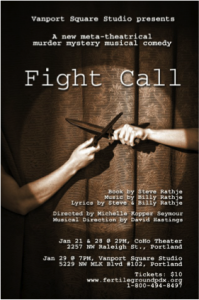 For those of you who are reading my blog for the first time, Fight Call is a “metatheatrical, musical murder mystery comedy” that I wrote with my brother. I composed the music, he wrote the script, and we collaborated on lyrics. 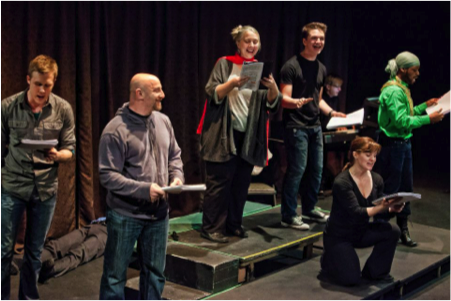 It explores the foibles, rewards, and humor of the theater in a 17-song, full-length musical. I was extremely fortunate to have the opportunity to have the musical produced as a staged reading at Portland’s Fertile Ground Festival for new theater. 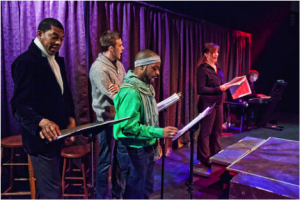 Now to discuss the performances: the show ran for two weekends at CoHo Theater and Vanport Square Studio in Portland, Oregon. 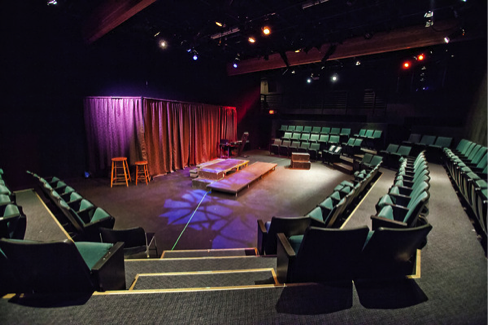 We performed in a black-box style theater with a cast of professional Portland actors, and a live accompanist (exciting, because in the first reading we used piano backing tracks that I recorded!). Watching one’s work being produced provides both a remarkable and an extremely strange feeling. 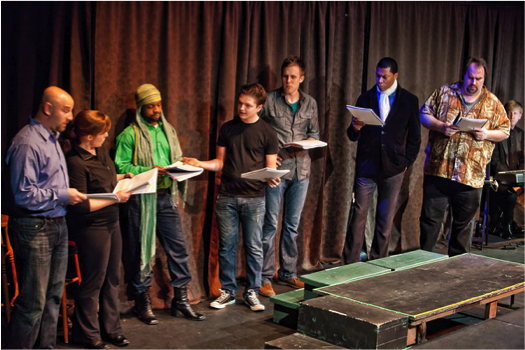 This was the first time that I had ever seen this show from the house, since I had acted in and directed the original reading. Even during rehearsal of this show, I was involved in the process, so I didn’t have a chance to be really part of the audience. Watching the performances was quite an experience. I finally had a chance to step back and hear every note and word that I’d written. I must say, it’s very nerve-wracking wondering how the crowd will react, but I was very happily surprised by the show’s reception. 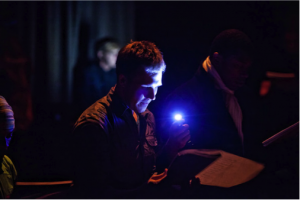 The shows performed for full houses, and we received some great feedback. It was really amazing to be working with such high-caliber performers, and to have an audience largely composed of people I didn’t know supporting the production. 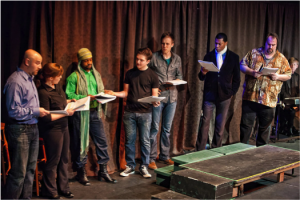 We also had “talk-backs” after every show where audience members could ask questions of the actors, writers, and directors. 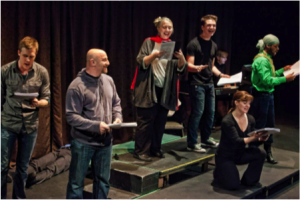 We had the chance to explain some interesting aspects of the development process, such as the show’s three-year genesis from a play with one song at the end to a full-length musical. Ironically, the first song we wrote was cut from the show, although you can still hear remnants of its main theme in one of the early songs. All in all, the performance process went great. My brother and I were extremely lucky to be working with such a supportive cast and directors. I have to hand it to our entire company for their patience and enthusiasm in working with an entirely new musical script and score. Having the opportunity to see the show produced by such talented individuals is indescribably useful for the show’s development process, and I know that it’s given my brother and me lots of ideas and confidence going forward. 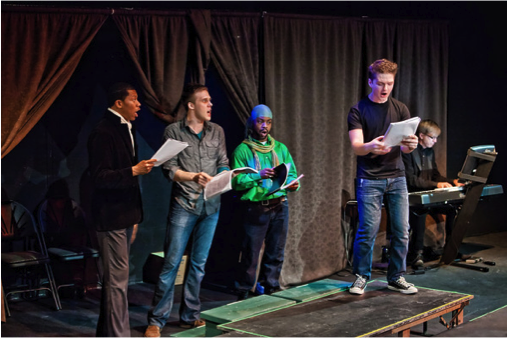 This entry was posted in 2011-12, Billy Rathje '15 and tagged 2012, Billy Rathje, Fertile Ground, Fight Call, musical, Musical Comedy, Musical Theater, Oregon, Original, Portland, Puget Sound, Steve Rathje, Student Written, University of Puget Sound, UPS. Bookmark the permalink.